CAST (www.castsoftware.com) is an independent software vendor that is a pioneer and world leader in Software Analysis and Measurement (SAM). With more than $120 million cumulative investment in R&D, CAST provides the most advanced technology in the world to capture and quantify the reliability, security, complexity and size of business applications. As you can imagine, collaboration is key. On 8/26/15 in New York City 52 employees of CAST Software, Inc. got together for a fun and meaningful teambuilding program. Employee Katie (Kathryn) Farrell, Field Marketing Manager at CAST was the point-of-contact and instrumental in organizing the event. “I really wanted to do this program and so excited we were able to this year”, said Katie. With cross-functional employees from North America, Europe, and India, participants had the opportunity to get to know each other better with facilitated activities that encouraged collaboration which was one of the main goals for the event. Our instructors kicked off the event with a high-energy introduction that really got everyone in the room engaged. 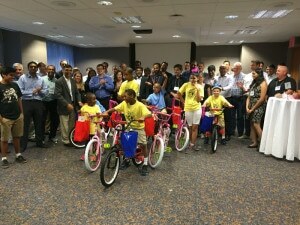 Employees worked first with partners, then participated in a fast-paced “get to know you” group activity, and after the laughter died down, small teams were formed for the anticipated Build-A-Bike. Led by The Leader’s Institute instructors Dan Eckelman and Michelle Riklan, the group had a FANTASTIC experience. The location for this event was CAST Software, Inc., 321 W 44th Street, Suite 501, New York, NY 10036. Thanks to CAST, the Boys and Girls Club, and Michelle and Dan fora great team building event!